Use the 2500 System for ponds from 100 Gallons up to 5,000 Gallons. 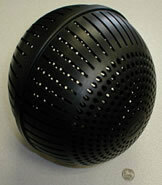 Use the Small Pond Biosphere Pro for ponds from 6,000 Gallons to 50,000 Gallons. Use the 1/4 Acre Biosphere Pro for ponds from 50,000 Gallons + up to 250,000 Gallons or use in multiples for ponds up to 1/2 acre in size. See below for details on each of these items. You can also view some frequently asked questions on the products here. Easy and safe to apply to any pond up to 2500 gallons. Use multiple dispensers to treat larger ponds. Helps to limit or reduce unwanted growth by helping to break down the organic build up and excess nutrients that are the root cause of algae...don't just treat a symptom! Three small packets will treat a pond for an entire month! Refill kits come in two handy sizes. 800 gallon maximum for ponds up to 800 gallons and 2500 gallon kits which can treat any pond from a bit over 800 gallons up to 5,000 gallons when used in multiple quantities. 2 month supply - 6 packets per kit. *When kept or stored in a cool and dry place, these refill packets can remain usable for 2 to 3 years. For treating ponds from 6,000 Gallons up to 50,000 Gallons. The all season aquasphere will treat ponds in a broad temperature range (34 degrees to 100 +) and in all seasons. Use one sphere every 30 days. Choose your pond size of 10,000 gallons or less, 20,000 gallons or less, or 50,000 gallons and less at checkout. **The biospheres are not refillable and can be disposed of in any plastic recycling center. Q. I'm concerned about my dog and children playing around the pond. Is the Algae Solution really safe? A. Yes, AS is totally safe for people, pets, fish, and most plants. AS doesn't really kill anything directly but works to reduce the organic "compost" and nutrient levels in the pond. By doing this, it not only helps to break down organic matter in the pond but it also cuts algae off from it's nutrient sources, thereby starving it off. It is a gradual process as well, which means that the fish and plants in the pond won't go through rapid changes in oxygen and pH levels...both of which can be lethal for fish. AS is a totally safe alternative to using chemicals in your pond. A. Small ponds are dosed based on gallon size. You can calculate this quite easily by taking the length in feet X the width in feet X the depth in feet, then multiply this total by 7.85 to get the gallon amount. The Algae Solution 2500 will treat any pond up to 2500 gallons. We have two different refill packets available for 800 and 2500 gallon ponds. The main thing to keep in mind is you do not want to underdose with any natural product. This will only lead to poor results. So the gallon statements are for any ponds up to the recommended sizes. You can also combine several 2500 units to treat ponds up to 5,000 gallons very effectively. We recommend using the small pond Aquasphere for any ponds much larger than 5,000 gallons. Q. What if I use too much AS? Can I overdose my pond with it? A. Not really. Unlike chemicals where there is a great risk for overdosing, natural bio products will simply quit working when there are no excessive nutrients in the water. AS is designed reduce or eliminate the excessive build up of nutrient loads in the pond but it will not "outcompete" rooted plants. Since algae has no roots and is totally dependent on nutrients that come directly from the water, AS can outcompete algae for these nutrients and in that way, it can eliminate it. A good way to look at AS is that it is a very good supportive agent for desired plants in your pond. Having enough aquatic plants in a pond is great natural way to reduce algae. The problem is most experts recommend having a 60 to 80% coverage of the surface to make this work. Most people don't want that many plants in their pond and would prefer a bit more open water. By combining AS with a few desired plants, you can achieve the same results as having many plants in the pond. It's a perfect solution for pond owners look for natural, eco-friendly algae control.